With a sheet music for reference, we can now see the value of Sekaiju’s Musical Score interface. But for now, we will discuss another commonly used note entry method in DAWs and other MIDI editing programs, the Piano roll. We will be “manually” converting a sheet music of Silent Night into MIDI. If you can read music, then you can interpret the notation and convert it to piano roll (I also realized that this is a great way of practicing sight reading without a musical instrument in hand). Each major division is a measure/bar and the minor divisions are quarter notes. Since we are using 3/4 time signature, we see 3 divisions per measure. For reference middle C is MIDI note number 60 which can be located in the sideways keyboard in the left. As I mentioned previously in the introduction to Sekaiju’s user interface, zooming is done by pressing the little plus and minus (+ -) buttons along the scroll bars, or by using “Ctrl +” and “Ctrl –” keyboard shortcuts. (I have to rewrite it here as it was not obvious to me back then). Also, the Piano Roll window is shown by selecting “View -> Show new Piano roll window” or clicking the button with little purple rectangles looking like a piano roll. I find it difficult to tell someone how to draw without telling him what the drawing tools do. Hence, I have to go through a few basics before we can create a simple song. Feel free to skip this section if you want finding things out through your intuition :). Toolbar Buttons in the Piano Roll. From left to right:Pen, Line, Erase, Select and Preview. Draws a new note with a pitch determined by its position and duration by the set or previous note length. Extends an existing note by dragging a note if it is close enough in the left or right edge of that note. Moves an existing note by dragging when it near the middle of that note. The note is played in the process, even if it is not moved to a new place. Draws a series of connected notes with equal lengths connecting a starting point and an end point. As it goes through the chromatic scale, I seldom use this for note drawing. 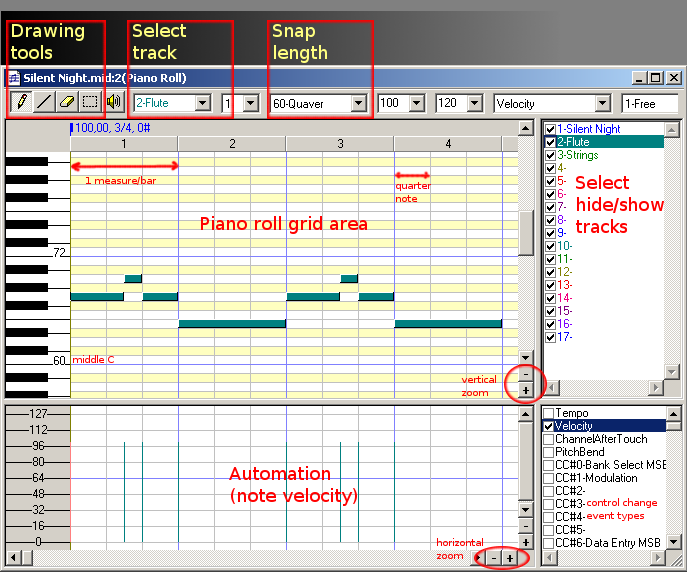 Does the same in the automation part below the piano roll (where it is most probably intended to be used). Useful for making linear volume ramps. Selects multiple notes and allows multiple notes to be simultaneously extended to the left or right, or to be moved. Also works for a single note. Allows keyboard or menu actions like Copy, Cut, Delete to the selected notes. 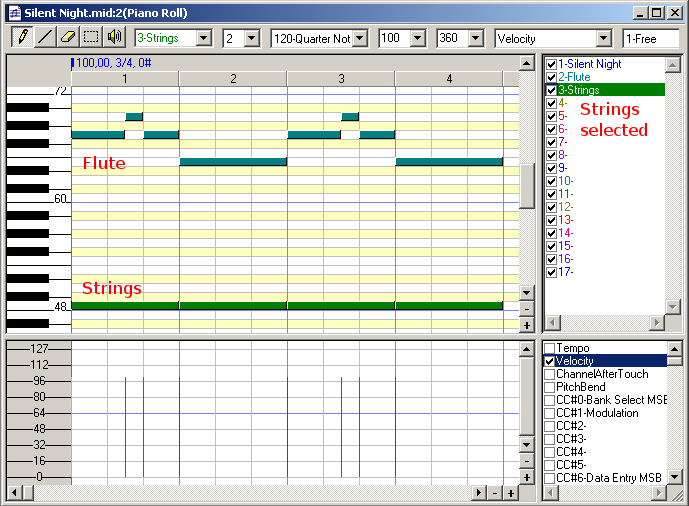 Plays existing notes when the cursor is dragged on top of them (you will see a vertical line). Entering notes through the Piano roll interface. 1. We start by selecting the flute track (second) in the right panel. This means that notes we will be drawing will belong to the flute track. We may also select the flute track on the Track dropdown just beside the Preview button. 2. Set the snap length. Since the smallest note is an eight note or quaver (♪) and the notes on the song are multiples of a semiquaver, we could choose 60-Quaver from Snap dropdown (third). (I normally ignore those tick numbers when working as there is enough visual information in the piano roll). 3. Choose the Pen tool and start drawing on the piano roll grid area. Create notes by clicking on the grid. Each new note’s size will be the same as the previous note’s size (or the default size for the first note). Resize the notes by dragging their edges with the pen tool. Creating notes on the Piano roll. You may play your work at any point using the Playback button in the main toolbar or hitting the spacebar in your computer keyboard. 1. Select the strings track from the right panel or the Track dropdown list. 2. Since there is only one chord per measure in the song, we can use a larger snap like 120-Quarter note. 3. Proceed with the Pen tool, just like when editing the flute track. For simplicity, I only used the root of the indicated chords in the transcription and play them an octave below the melody. This may look quite boring as the first few measures use C chords. But there you have it, just repeat the steps to finish the song and you will get MIDI song file from scratch! Silent Night in Flute and Strings. The next and final part of this tutorial will deal with using the musical score window which may be easier if we are copying directly from a score as in this example.